Breadcrumbs in WordPress website? Yes, you read it right. The title may seem a little weird to those who are new to website building and WordPress. But this is something that every WordPress website owner should be familiar with. One may think of breadcrumbs as some bread crumbs spread out literally. Well, as a matter of fact, this is how they actually got their name in the online world. Breadcrumbs are a clean feature that helps webmasters to present the user with the brief information on where they have moved to and how to easily go back to the page they have previously visited. In simpler words, breadcrumbs are navigation links that appear horizontally on the top of the web page, usually below the navigation bar or header. These breadcrumbs hold links of each previously visited the page by the user to reach to the current page. In addition, this feature also makes SEO and user-friendly hierarchy of pages which in turn forms the structure of the site while using it efficiently for search engine rankings. Don’t confuse breadcrumbs with the navigation menu system in WordPress. Online success of a business depends significantly on the appearance of the website. Believe it or not, if your website does not hold attractive appearance, you may find yourself lagging behind. However, integrating breadcrumbs make your website look aesthetically appealing while adding an added functionality as well. Breadcrumb offers intuitive means of navigating on the website. It also allows easy backtracking if your website is made with many layers. It makes navigating through these layers a lot easier. As a matter of fact, a majority of things we do for our website directly affect its SEO. And breadcrumbs is no different. Google easily interprets your navigation links and add them to their results page as well. How breadcrumbs affect search engine rankings? Breadcrumbs also make it easy for the search engines to crawl your site and index it. Let’s suppose a user has searched for “10 Outstanding Widgets for Commanding WordPress Website” and lands on our website’s blog through Google’s search results and wants to understand his location on the website. Besides breadcrumbs, there is no way to know what the structure of the website is. Breadcrumbs guide users about their location on the site and help them to understand the hierarchy of your website. Having navigation links on your website assists search engines to find your web pages easily. 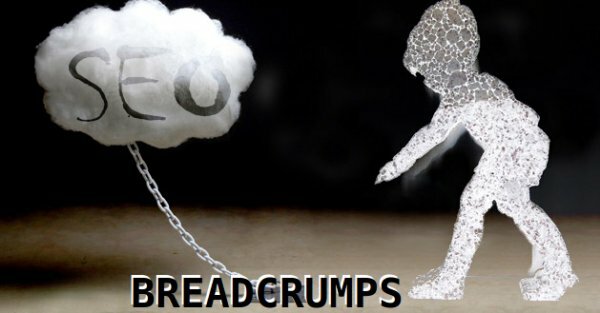 Breadcrumbs build a good internal linking structure for your website which directly or indirectly affects your search engine rankings. Does your website need breadcrumbs? Not every website needs to integrate breadcrumbs. It is more commonly seen on huge e-commerce platforms such as amazon.com, ebay.com and more. The whole concept behind integrating breadcrumbs is to make the navigation experience smooth and user-friendly. Moreover, to make navigation easy for users as much as possible. Amazon.com uses breadcrumbs to help users identify which category or folder they are in. A majority of websites integrate breadcrumbs on the basis of the content available on the website. If you think there is more content on your site which cannot be managed easily, then breadcrumb is the right choice for you. Adding them to your website gives users full control over the navigation. Various search engines such as Google have also begun showing breadcrumbs under the title of a website in the search results page. This way your website gets more visibility and have improved click through rate. How to add breadcrumbs navigation links in WordPress website? WordPress, as we all are aware that, comes with various useful plugins that help you extend the functionality of your website. And adding breadcrumbs is no different. There are various WordPress Plugins available that allow you to add breadcrumbs to your WordPress website. Here, we have explained the top 2 in detail. Yoast SEO is a great SEO WordPress plugin that allows you to add all the relevant Meta details on your website. It also helps in improving search engine rankings of a website. However, a majority of webmasters are not familiar with the fact that Yoast SEO Plugin also allows you to add Breadcrumbs on your website. Download the plugin from the WordPress dashboard itself or manually from the WordPress.org site. Install and activate it in order to configure it for breadcrumbs. Once activated, you need to configure this plugin to actually make it work. Click SEO → Advanced page and enable the “enable breadcrumbs” option. Once enabled, you will encounter various options to alter how breadcrumbs would behave on your site. Though default setting work for almost every website, you can still modify them according to your requirements. Don’t forget to save the changes. In order to display breadcrumbs on your website, you need to copy and paste the following code snippet in your header.php file. Breadcrumb NavXT Plugin is one of the best plugins to add breadcrumbs to your WordPress website. 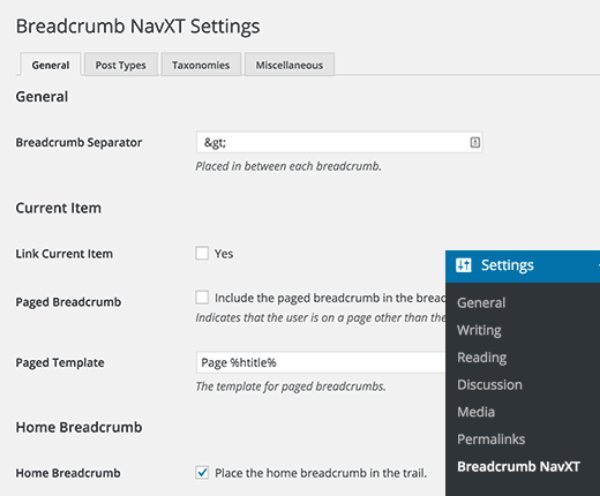 First of all, install and active Breadcrumb NavXT plugin. Once you activate it, open it’s setting page to configure it. Click settings → breadcrumb NavXT and you will be directed to its setting’s page with general tab opened by default. 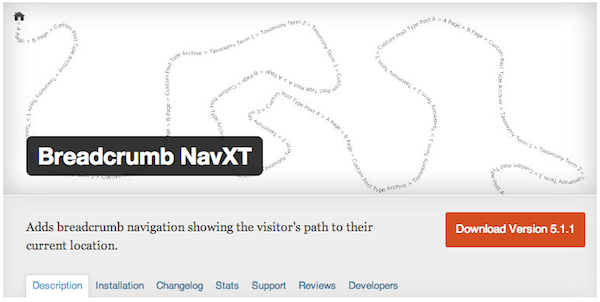 General tab of the plugin is defined how Breadcrumb NavXT plugin should behave on the website. It also enables you to alter the navigation links template. You may also see that these template links employ schema.org parameters. Post Types tab enables you to set breadcrumb for pages and posts or any other custom post types. You can also choose to show the post hierarchy in categories with tags, post parent or dates. The next tab taxonomies offer the similar templates for your navigation links. Add this code snippet to the header.php file of your WordPress theme to make this plugin work. You can always experiment new things with breadcrumbs. It is obvious that you would find adding them manually on your website difficult if you are just starting out with the WordPress. This is where WordPress plugins come in handy. They not only make the whole process a lot easier but also allow you to understand exactly how it should work. Moreover, you can also style breadcrumbs with custom CSS according to your personal choice and preference. However, don’t forget to include them on pages that need them and not on the homepage. If in case, your website has many web pages, then this feature is designed especially for you. The bottom line is breadcrumbs are designed to be a utility since it not only helps your users to navigate easily to your website but also improves your site’s search engine rankings. It allows your users easily traverse through your site and not get jammed along the path.